A thing can be anything other than a human being by this official definition. Ergo, flies, mosquitoes, cats, goats, bears, cars, airplanes, ideas, and publicly traded limited liability corporations are all things, which means that they are not persons, in any sense. A business corporation was an idea of a business model somebody thought up 500 years ago. It wasn’t a human being, since it was a thought that sprang from somebody’s head. It still is only a thought. According to Dictionary.com the word legal means “permitted by law; lawful.” They define “fiction” as “something feigned, invented, or imagined; a made-up story.” Some of the synonyms for “feign” are fake, bluff, counterfeit, and devise. Therefore, an artificial person is not real, and in the corporate sense, it’s not even an artificial person, like an artificial flower is something tangible, such as a plastic flower. Rather, it’s an idea from somebody’s imagination. Most likely a corrupt politician long ago had an idea that the best way to give an idea called corporation constitutional rights was to label it an artificial person, although it was only an idea, and not an artificial anything. 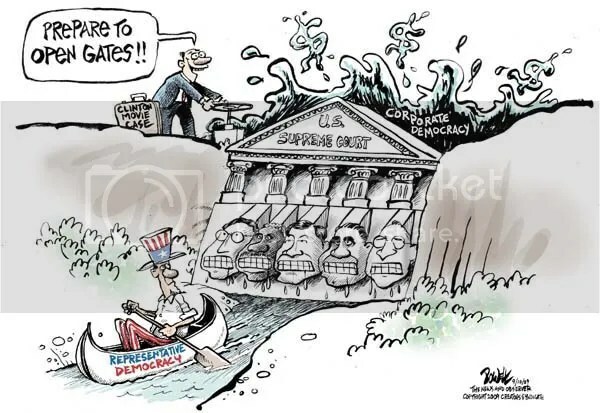 In 1886, the US Supreme court is thought to have ruled that the idea called publicly traded limited liability corporations were persons, and to have equal rights under the law with organic persons, based on the equal protection clause of the 14th amendment. This decision, of course, was based on corruption within the court, rather than any legal perspective, because there was no other sense to it, especially from a legal point of view. But the decision still stands more than a century later. In 2010, the US Supreme court expanded this idea and gave the ideas known as corporations personhood rights, which shows that the corruption of 1886 is still strong today. It doesn’t take a giant of a mind to figure out that a corporation is an idea, and not a person, and so one can be reasonably certain that corruption, which permeates the US government, also soaks the corporate wing of the US Supreme Court to the marrow. Besides, if I call a guitar cord, say A, an artificial person, does that make it a person, a human being? Obviously not, but the justices on the US Supreme Court have decided in that if you label an idea as an artificial person then it must be so. You have to wonder how much cash these folks on the US Supreme Court are getting under the table. In which case, you can see why Chief Justice John Roberts swore under oath that he would respect legal precedence during his senate confirmation hearings, and then he voted to end 100 years of legal precedence when he voted yes in the Citizen’s United Case. This benefited only billionaires and their corporations. It’s strange that Roberts, as well as fellow supreme court justices Samuel Alito, Anthony Kennedy, Antonin Scalia and Clarence Thomas are not able to read a dictionary and figure out that an idea is not a person, even if somebody had an idea to label another idea as an artificial person. Is it because they’re mentally incapable of seeing the obvious, or because they are corrupt? It is likely the latter since these persons are not stupid little boys. And that is the case against money in politics. We can assume corruption is playing a role in the rulings of the US Supreme Court, as well as in the enactment of legislation. Well said. If there is anything that exposes the agenda of the Court’s Majority (and their lack of “independence”) it is this idiotic decision. Thanks for commenting Steve. You always have insightful comments, and I appreciate you!